Joe Metott receives a CNY Chapter Scholarship from John Cherundolo at the NFF Scholar-Athlete Dinner held recently. 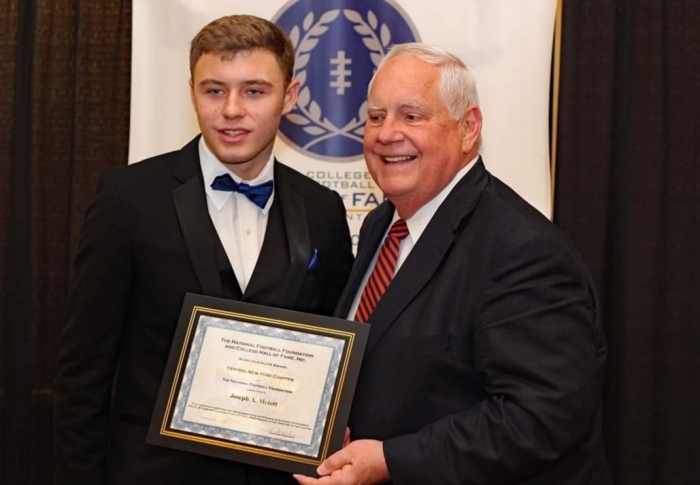 Sandy Creek High School senior Joseph Metott was honored at the National Football Foundation Scholar-Athlete dinner held Jan. 27 at the Turning Stone Resort. The 18th annual event presented more than 70 scholarships and special awards to football players in the Central New York region for their academic and athletic achievement as well as their community involvement. Metott was awarded a CNY Chapter Scholarship at the black tie affair. He is the son of Heidi and Rick Metott.